Women are always on the lookout for new technologies and beauty products that will help prevent signs of aging and rejuvenate their looks. The healthy fresh-faced look has never gone out of trend, and as technology improves, women are turning towards non-surgical ways to get a face lift. One popular device is the microcurrent machine. Microcurrent therapy has been around since the 1970s, and a wide range of modern microcurrent machines are used by both professional beauticians and the modern woman at home. In today's review, we’ll be having a look at the top professional and at home device available on the market. We’ll also tell you how the machine works, the results of using it and how effective it is. A microcurrent machine, which can be classified as a cosmetic electrotherapy treatment, is a nonsurgical facelift, anti-aging, and toning machine. The machine sends low level electrical vibrations and pulses to the face, stimulating your facial muscles. This can almost be compared to receiving a light facial massage. Tone the facial and neck muscles for a lifted appearance. Every person has their own bio-electric current, and microcurrent machines send microampere (millionth of an amp) currents that mimic your body’s own electrical frequencies. These currents stimulate the golgi tendon organ, which senses any muscle tension. As a result, the facial muscle is exercised, similar to any other muscle during a workout session. Because your facial muscles are connected to your skin, this exercise gives you a lifted appearance. 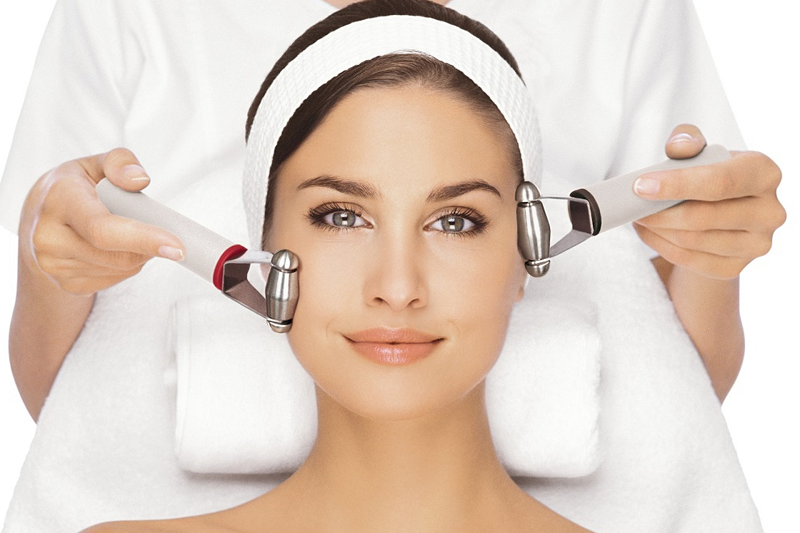 The microcurrent machine also increases the ATP, helping blood circulate while boosting collagen as well as elastin. Collagen helps replace dead skin and strengthens the skin. Because microcurrent machines exercise your facial muscles, your face gets a toned appearance, similar to how you look more toned after working out. You will notice your face looks more lifted, especially in the creases near your nose, between the brows and on your neck. The collagen boosting function of these machines means that signs of aging are corrected and over time, wrinkles and scarring fades. The overall facial appearance looks evened out and smoother. Microcurrent machines can even be used to help reduce stretch marks and cellulite. Most microcurrent machines come with a conductive gel. This gel is important, because the ingredients help nourish the skin and lock in moisture. Professional beauticians often have special medical grade machines to use for treating clients. Luckily for the modern woman, a microcurrent treatment is possible to achieve within the comfort of your own home. There are now a number of both professional and at home devices in the market. The difference between these machines is the wattage used and frequency. Professionals using microcurrent machines need to know all 32 muscles on the face, in order to lengthen or shorten the muscle (this is known as facial toning) most effectively. Now that you know how microcurrent machines work and their results, let’s review the top microcurrent machines to fit your needs so that you can be on the fast track to rejuvenated skin. This kit comes complete with a NuFace Trinity Device, Trinity Facial Trainer and Trinity ELE Attachment. This means the kit comes with two machines, and it is also FDA approved. The Trinity ELE attachment is used to target hard to reach areas, such as eyebrow furrows and crow’s feet. The NuFace Trinity Facial is a multi-solution skin care treatment that stimulates facial muscles to lift the face, improve contour, reduce wrinkles and even out skin tone.According to the manufacturer, 85% of clinical study users experienced significant improvements in facial contour after using the machine. To use the machine, spread the primer gel onto your face evenly. Hold the machine over each area for about five seconds. You should be able to cover all areas of the face in five minutes. Use this three to five days a week. The NuFace Trinity Device allows you to put on different attachments, it has a rechargeable battery and an auto shut-off. This high frequency microcurrent treatment helps increase blood circulation and increases cell metabolism, reducing wrinkle lines and helping your skin to repair. It also removes blemishes and can be used on all skin types. This device comes with four different probes: a comb, the mushroom probe, the bend and the tongue. Using the comb through the hair helps blood circulation on the scalp area and is known to reduce dandruff. The mushroom probe can be used on large areas like the cheeks, forehead and jawline. The bend is used with higher frequency to cure spots. The tongue is designated for wrinkles and fine lines. The voltage used is 110V (with a US plug) and the frequency is 50-60HZ. This microcurrent device was made in the European Union and has now been introduced to the United States. It safely and gently uses electric currents to remove wrinkles, fine lines and cellulite, reduce eye bags, even out the skin tone and firm jowls. The probe is self-sterilizing and it’s cordless, so it’s convenient to use and travel with. To use this device, apply the Spectra 360 Electrode conductive gel that comes with the kit to your face evenly. Adjust the Beauty Star’s dial between 1, the lowest and 10, the highest. When you feel a slight tingle, that means the machine is working. Use regularly to see the best results. This product is backed by a one year warranty. The Skin Care Experts microcurrent device comes with large dual facial probes to help fill in wrinkles, smoothen out skin tone, reduce cellulite and remove scars. It penetrates the skin with electric currents to give you a salon-like facelift at home. This device is cordless, so it’s convenient to use at home or on the go. To use, put a primer evenly over your face. Use the device over your face for 15 to 20 minutes per day, and the manufacturer states that you should begin to see results in 28 days. The longer you use it, the better the results will be. This device does not come with a conductive gel, so you will need to purchase one for best results. This mini microcurrent device is used to target the eye area, which is both sensitive and a problematic area for most women. The probe is designed specifically to use around the face, namely the eye area. This device is portable and is used to reduce wrinkles and even out the skin tone. The kit comes with a conductive lotion to apply to your skin before using the device. If you want to add a serum along with the treatment, for best results apply a hyaluronic acid serum on the skin and use the machine’s highest settings. Skin Act brings you a professional non-invasive and non-surgical microcurrent face lift with their Bio-Lift Microcurrent facial machine. As with other machines, this one uses electrical impulses to boost ATP and collagen production, and is to be used by a properly trained operator. The manufacturer states that this product is best used with a Conductive Facial Gel with DMAE. While this device is portable and is convenient to use for professionals, it is also an FDA cleared medical device. It delivers 400 microamps of current and you can use lengthening and shortening techniques, depending on the target area’s needs. The unique shape of the wand is meant to target the golgi tendon, which effectively exercises facial muscles to tone the skin and boosts ATP and collagen production. The wand is easy to use, and can target problem areas like frown wrinkles. The machine comes with 2 different programs. It comes with charged batteries, a recharge adaptor, a conductive gel and an applicator set. You can also learn more about the device directly from 7E, as the company holds education webinars with beauty industry leaders for additional training. In the 19th century, after scientist Luigi Galvani found that electricity can make a frog’s muscle twitch, scientists and researchers have been looking into cosmetic electrotherapy treatment. Microcurrent treatment has been around since the 1970s and has proven to be effective. The treatment triggers the body’s production of ATP, which speeds up skin cell repair and promotes healthy cell production. It also sends electrical currents to lengthen and shorten the muscle, also known as toning. When a muscle goes through the lengthening or shortening process, the skin begins firming and lifts. Using low electric current makes this process much more comfortable for the user or client. Clinical studies have shown that after going through microcurrent therapy for twenty days, the following benefits are observed: lifted jowl, neck and eyebrows, improved muscular facial tone, reduced wrinkles, and improvements in other skin problems such as sunburns. Many of the microcurrent machines we have listed today are FDA approved and medical grade. In conclusion, microcurrent machines have been clinically proven to effectively improve your skin’s elasticity and tone by exercising facial muscles through electric currents. For those of you looking to get a non-surgical face lift, microcurrent machines may be the perfect solution. You can use them as an anti-aging device, and with most of the devices we recommended, the longer you use them the better the results. There are many different options to choose from, from at home devices or portable devices to professional medical grade machines. Most products we recommended today come with a conductive gel, which improves your complexion and speeds up the process of skin rejuvenation. At the same time, you may want to incorporate night creams into your skincare routine for better anti-aging results. We hope the tips and reviews we gave today will help you understand more about microcurrent machines and the benefits of using microcurrent treatment, as well as giving you a peek at the best devices on the market.